Drinking from the firehose again. First published 2/1/2018; LinkedIn.com; publisher: GiantPeople. The USAF taught me about the “Memo For Record” (MFR) concept, and to this day I frequently jot down memos like these while my thoughts are fresh. As an employee, I’ve worked for about half a dozen startups, one of which was a big win (Verio’s sale to NTT). As a founder or co-founder, I’ve done about a half a dozen startups, two of which had successful exits (my book and publishing company that paid for law school, and the Heels.com shoe store that I spun out from my surname). A couple of epic failures in there as well. And a couple ongoing startups (including my consulting company and my law firm). As a legal advisor, my law firm has advised hundreds of startups, 20 of which have been sold to public companies. Last year, when I was looking for ways to give back, a friend and colleague connected me with the Techstars Autonomous Technology Accelerator with the U.S. Air Force program, suggesting that I may be a good fit as a mentor. When I was invited by Warren, the Managing Director, to be a mentor, I discovered not only that I fit in, but I also found the glue that holds the startup community together, and I rediscovered the joy of giving back. Yesterday was my first day of “Mentor Madness” at the Techstars USAF in Boston. During this period, all ten of the startups meet with all of the mentors, kind of like “speed dating.” My day was divided into two identical chunks: five 30-minute meetings with the startup founders followed by an hour-long mentor debrief with Warren and the other mentors. I chose to meet with all ten companies in one day, which was both intense and satisfying. Yet I would be an unlikely choice as a lead mentor for any startup in an accelerator program, in part because I have never been a CxO, never been a Techstars mentor, never done any sort of startup accelerator program. But I do have an odd mix of experience and skills (USAF, marketing & sales, startups, IP) that may be a good fit for some company. Although I am both an entrepreneur and a lawyer, I primarily consider myself a marketing person. When I was trying to sell myself into the marketing & sales job at Verio in the late 1990s, I had to answer the objection: “What does a lawyer know about selling?” I answered that everyone is in sales! And that anyone who has ever proposed marriage has learned about emphasizing the positives and downplaying the negatives. The science and art of selling a story to a jury – or of selling a patent to the USPTO – involves the same thinking that is required to sell a product/service to a customer. For this reason, marketing documents – not technical documents – are the most helpful for writing patent applications! I am a visual thinker and frequently find myself drawing pictures to explain my thoughts. This picture – of about how I learned to think about sales from my mentors – has been in my head for years but not on paper until now. This is not an original concept and likely is derived from one of the many business and marketing books I’ve read over the years (likely sources include “Marketing Management” by Kotler and “Selling The Invisible” by Beckwith). In this time of battling inertia, you will find yourself engaged in “lower left” selling, where your pitch involves the disadvantages of not buying. Don’t want to buy life insurance? Bad things will happen after you die. 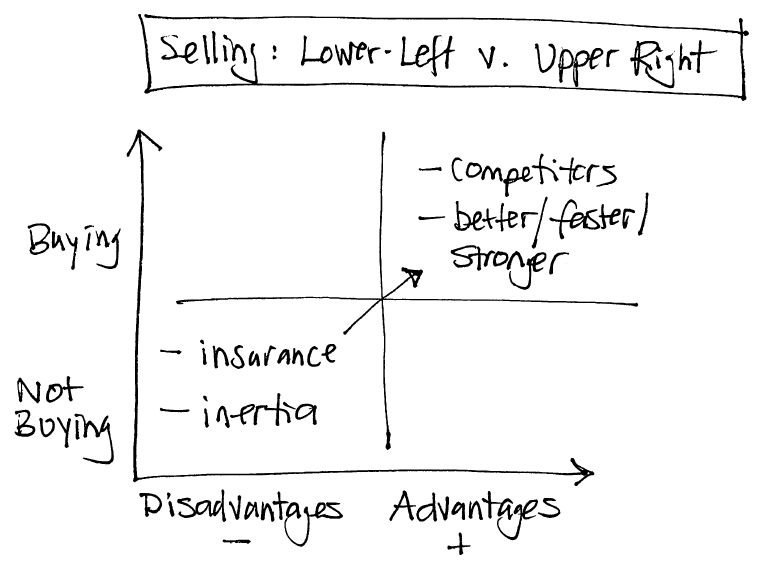 Later, with more mature products and markets, when competitors are easier to identify, you can move to “upper right” selling, where you focus on the advantages of buying your product, and why your product is better/faster/stronger that your competitor’s product. You must put yourself in your customers’ shoes and think about both types of selling, which may mean AB-testing different pitches. It took many hours for the adrenaline of yesterday’s day at Techstars to dissipate. And just like startups and adrenaline, the joy of giving back with no specific expectations of return is also addicting! I’ll be back for more.